Did weather play a role in the crash of AirAsia Flight 8501? During the northwestward flight of AirAsia 8501 from Surabaya, Indonesia to Singapore, contact was lost with the aircraft over the Java Sea (likely east of the island of Pulau Belitung) on 28 December 2014 (late 27 December UTC time). Using the SSEC RealEarth web map server site, a fade between the regional map and the MTSAT-2 10.8 µm IR image at 23:00 UTC is shown above. The satellite image revealed that there were clusters of deep convection (thunderstorms with very high, very cold cloud tops) over the middle portion of the flight path. COMS-1 10.8 µm IR channel images (above; click to play animation; also available as an MP4 movie file) indicated that the coldest cloud-top IR brightness temperatures were in the -80º to -85ºC range (violet color enhancement) with these thunderstorms. The location of Surabaya, Indonesia (station identifier WARR) and Singapore (station identifier WSSS) are annotated on the images; the last point of contact (at 23:24 UTC) was approximately within the circle drawn just to the left of the center of the images, when the aircraft was flying at an altitude of 32,000 feet (9.75 km) over the Java Sea. There were reports from various media sources that the pilots had requested to divert their flight path and climb to a higher altitude to avoid adverse weather conditions not long before contact was lost. The corresponding COMS-1 0.675 µm visible channel images (below; click to play animation; also available as an MP4 movie file) showed evidence that there were some overshooting tops associated with these thunderstorms. Given that there was a long gap in available COMS-1 images (between 23:00 and 23:45 UTC), a closer view is shown using the 23:32 UTC MTSAT-2 10.8 µm IR channel (above) and 0.675 µm visible channel images (below). A circle is again drawn near the center of the MTSAT-2 images to denote the approximate location of final radar contact with the aircraft at 23:24 UTC — and the intended final destination of Singapore (WSSS) is labelled in the upper left corner of the images. Similar to what was seen in the COMS-1 images, the coldest cloud-top IR brightness temperature in the area at that time was -81.4ºC, and there was evidence of overshooting tops in the near vicinity on the visible image. (Note: due to the far southern location just below the Equator, the flight region on the 22:00 COMS-1 image was actually being scanned around 22:07 UTC, while on the 22:32 UTC MTSAT-2 image the flight region was being scanned around 22:39 UTC). A nearby rawinsonde report from Pangkalpinang (station identifier 96237 on the MTSAT-2 images) showed that the aircraft cruising flight level of 32,000 feet was near 300 hPa (9750 meters above ground level), where the air temperature was -29.3ºC and winds were from the west-southwest at 16 knots (below). The tropopause appeared to be around 100 hPa (at a height of 54,265 feet or 1654 km), with an air temperature of -86.5ºC — close to the coldest cloud-top IR brightness temperatures seen on the COMS-1 and MTSAT-2 IR images. Moisture was abundant throughout the atmospheric column, with a Total Precipitable Water value of 52.4 mm or 2.1 inches. MTSAT-2 water vapor image derived atmospheric motion vectors from the CIMSS Tropical Cyclones site (below) showed that upper-tropospheric winds over the flight region (located at the far top center portion of the images) before, during, and after the flight time were generally southwesterly to westerly in the 15-30 knot range. Deep convection is not uncommon in this region during this time of the year, when the Intertropical Convergence Zone (ITCZ) migrates southward during the Southern Hemisphere summer season. The presence of warm sea surface temperatures along with abundant Total Precipitable Water over western Indonesia (below) helps to create an environment that is favorable for the growth and maintenance of large thunderstorms. For an additional detailed meteorological analysis of this event, see the Weather Graphics site. On the third day of the search, aircraft debris and bodies of passengers were discovered about 66 miles southwest of the last known coordinates of AirAsia Flight 8501 (above). 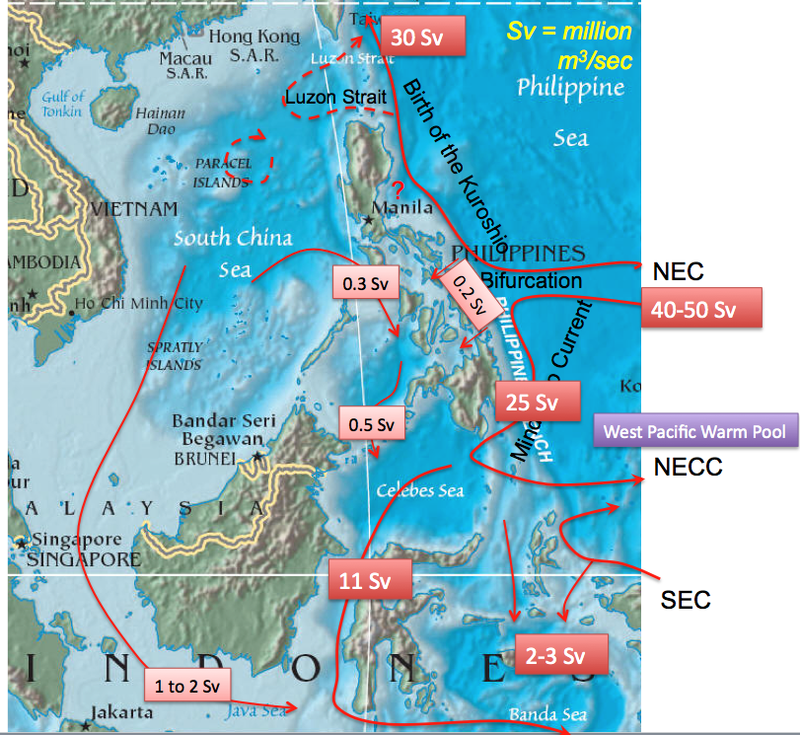 The prevailing ocean current in the Java Sea (below) may have displaced some of the debris southwestward from the actual crash site. The Indonesian Bureau of Meteorology, Climate, and Geophysics (BMKG) released their meteorological analysis of the AirAsia 8501 crash on 31 December. 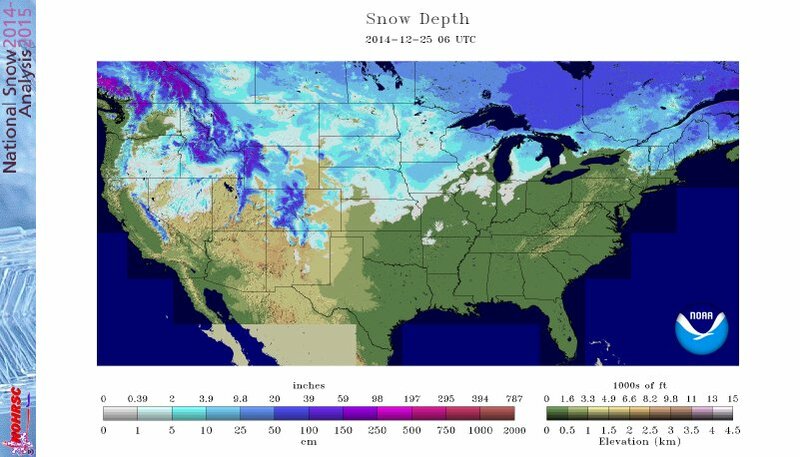 According to the National Operational Hydrologic Remote Sensing Center, only 35.5% of the Lower 48 states had snow cover on 25 December 2014. However, a deep cutoff low over the Hawaiian Islands had brought unusually cold air aloft (the 500 hPa temperature on the Lihue rawinsonde report was as cold as -18º C, which is extremely cold by Hawaiian standards) and strong winds, which prompted Blizzard Warnings to be issued for the high elevation summits of the Big Island of Hawai’i on 23-24 December. As the cutoff low departed and skies began to clear, GOES-15 (GOES-West) 0.63 µm visible channel images (above; click image to play animation) revealed the bright white snow-covered summits of Mauna Kea and Mauna Loa on Christmas Day. A toggle between a Suomi NPP VIIRS 0.64 µm visible channel and a false-color Red/Green/Blue (RGB) “snow vs cloud discrimination” image at 23:22 UTC (below) confirmed that the bright white features seen in the GOES-15 visible images was indeed snow cover — snow (and fully-glaciated ice clouds) appear as darker shades of red on the RGB image. Cloud tops that are partially glaciated appear as lighter shades of pink. Using the SSEC RealEarth web map server, the comparison below shows 375-meter resolution Suomi NPP VIIRS true-color RGB images of the Big Island of Hawai’i on 20 December (before the snowfall on the Mauna Kea and Mauna Loa summits) and also on 25-26 December (after the snowfall). On the 26 December image, you can see that the patches of snow had melted somewhat at the 2 summits; in addition, an increase in hazy volcanic fog (vog) can be seen drifting southeastward off the island; this vog was being generated by the ongoing eruption of the Kilauwea volcano in the Hawai’i Volcanoes National Park. AWIPS images of 4-km resolution resolution GOES-15 (GOES-West) 6.5 µm water vapor channel data (above; click image to play animation) showed the development of a patch of mountain wave or “lee wave” clouds immediately downwind of the higher elevations of the western Transverse Ranges in southern California on 21 December 2014. These clouds developed in response to strong northerly winds interacting with the west-to-east oriented topography (12 UTC NAM 700 hPa wind and height). As seen on the plotted surface reports, at Sandberg (station identifier KSDB) the highest wind gust was 52 knots or 59 mph at 17:42 UTC — and later in the day there also a peak wind gust of 87 mph at Whitaker Peak and 86 mph at Montcito Hills. In addition, there were isolated pilot reports of moderate turbulence in the vicinity of the mountain wave cloud at 20:21 UTC and 23:06 UTC; farther to the east there was a pilot report of moderate to severe turbulence at 01:27 UTC. A comparison of 1-km resolution MODIS 6.7 µm and 4-km resolution GOES-15 6.5 µm water vapor channel images around 21:00 UTC (below) demonstrated the advantage of higher spatial resolution (and the minimal parallax offset) of the polar-orbiter MODIS imagery for more accurate location of the mountain wave cloud. At 20:42 UTC (below), the coldest 1-km resolution POES AVHRR Cloud Top Temperature value associated with the mountain wave cloud feature was -69º C (darker red color enhancement), with the highest Cloud Top Height value being 14 km or 45,900 ft (cyan color enhancement)., which is actually colder and higher than the tropopause on the 12 UTC rawinsonde report at Vandenberg AFB. The highest elevation in the western portion of the Transverse Ranges where the mountain wave cloud formed is Mount Pinos at 8847 feet or 2697 meters, so it appears that a vertically-propagating wave developed which helped the cloud reach such a high altitude. At 21;20 UTC, a comparison of 375-meter resolution (projected onto a 1-km resolution AWIPS grid) Suomi NPP VIIRS 0.64 µm visible channel, 3.74 µm shortwave IR channel, and 11.45 µm IR channel images (below) showed that while the coldest cloud-top 11.45 µm IR brightness temperatures were around -60º C, the 3.74 µm shortwave IR temperatures were in the +5 to +10º C range — this indicates that the mountain wave cloud was composed of very small ice particles, which were efficient reflectors of solar radiation contributing to much the warmer shortwave IR brightness temperatures. A 375-meter resolution Suomi NPP VIIRS true-color Red/Green/Blue (RGB) image from the SSEC RealEarth web map server is shown below. The Japan Meteorological Agency has released the first images from the AHI instrument on the Himawari-8 satellite, which was launched on 7 October this year. This link shows full disk imagery from all 16 spectral bands. The AHI on Himawari-8 is very similar to the ABI that will fly on GOES-R.
A comparison of images using each of the 16 spectral bands is shown below, centered over the Sea of Japan. Cloud streets are seen over much of the open waters, due to the southeastward and eastward transport of very cold air from Siberia (surface analysis). Lee waves (or “mountain waves”) are evident on the water vapor bands (8, 9 and 10) downwind or southeast of the higher terrain areas on the main Japanese island of Honshu. 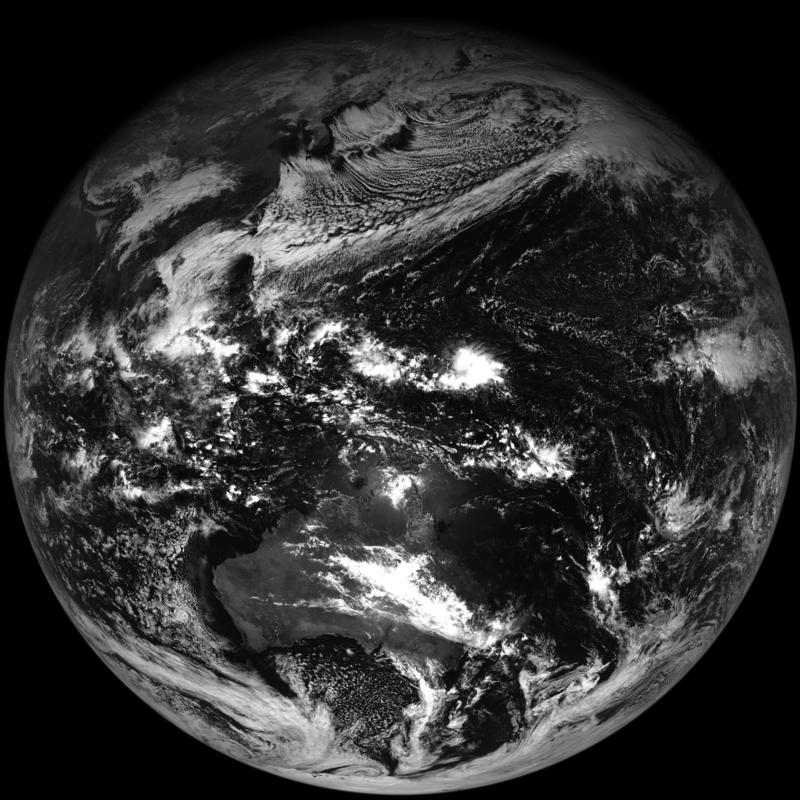 Similar comparisons of Himawari-8 images covering Hawaii, western Australia, and the far Southern Hemisphere are available on the First Light AHI Satellite Band Webapp. As seen on the MTSAT-2 vs Himawari-8 comparison below, even at large satellite viewing angles over the far southern portion of the Southern Hemisphere (for example, between Australia/Tasmania and Antarctica) AHI imagery such as that from water vapor channels exhibits higher quality (due to factors such as improved spatial resolution, signal-to-noise ratio, data bit depth, etc).